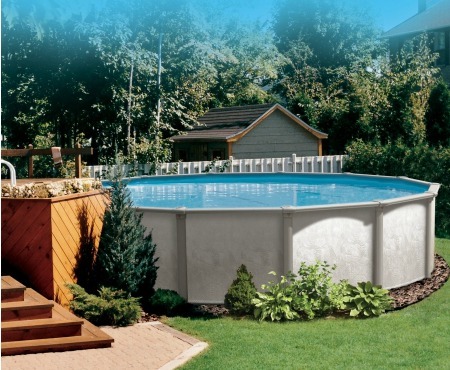 We are providers of Vogue above ground swimming pools which are world-renowned in innovation, always offering high-quality, value-added products that satisfy customer needs and expectations. Why would I choose an above ground pool? Easy to maintain, easy to service! Every piece of plumbing / mechanical is accessible! 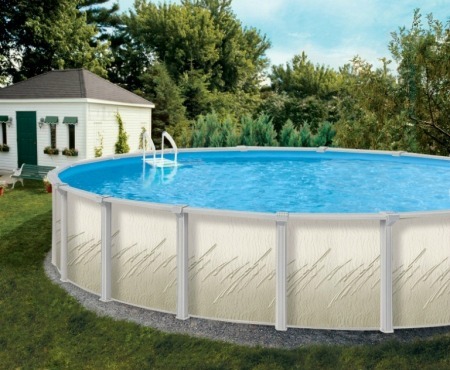 What’s the average cost of an above ground pool? 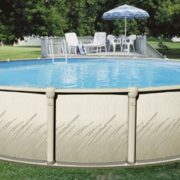 How are above ground pools constructed? Discovery: resin structure and top rails with steel wall and vinyl liner. Felt liner guard is placed under the liner over the soft sand fill. Zenith: Steel structure with resin top rail, steel wall and vinyl liner. Felt liner guard is placed under the liner over the soft sand fill. How do I decide what size to purchase? 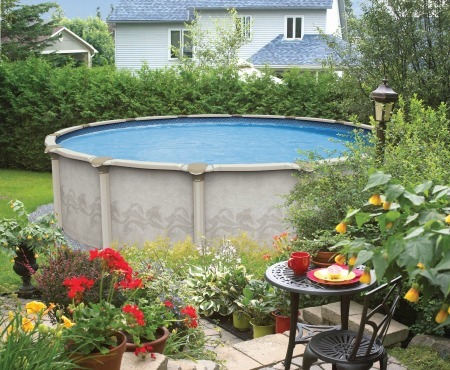 How much yard space do you want to dedicate to the pool? In most cases it’s ideal to leave a 3’ walkway around the pool. We are always happy to visit your property to lay out different sizes of pool so you can see exactly how they will fit in your yard! 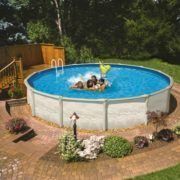 Do I need a permit to install an above ground pool? 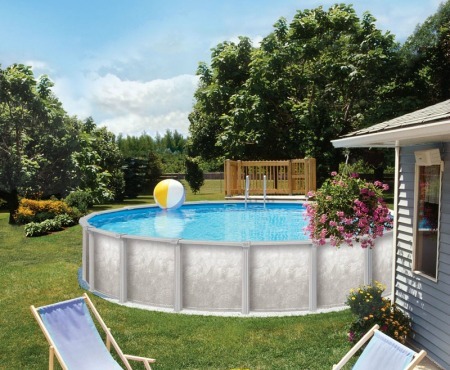 What’s the process of installing an above ground pool? Structural supports are erected on ring, steel wall is installed in place and resin top cap is installed. Pool is filled. After filling components are tested, water is treated, and we provide an instructional session on how to operate / treat your pool! 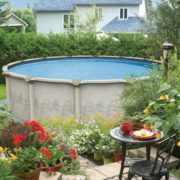 Can I heat my above ground pool? Yes! Heating will extend your swim season 2.5x longer!!! 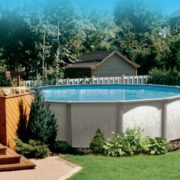 What is involved in maintaining an above ground pool? Just like with a hot tub this depends on how much use the pool is getting. In most cases you will have a weekly water treatment regime. 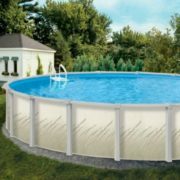 How long will an above ground pool last? 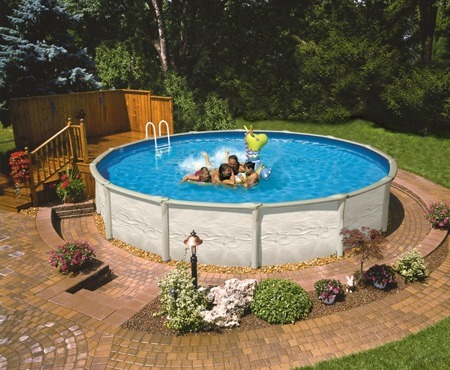 If you install one of our pools today, and have your first child tomorrow, that child will be grown and out of the house, will have their own children that will grow up and move out of the house and the pool will still be standing! 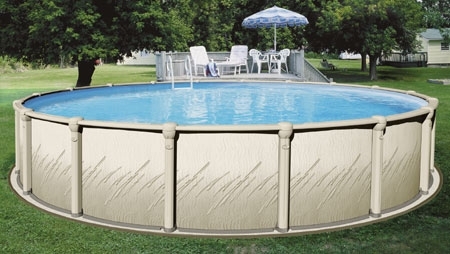 At this point you would have replaced a couple of liners and covers, but our above ground pools are rated for 40 or 60 years depending on the model you choose! 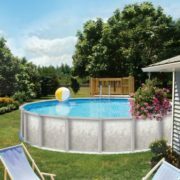 What do I do with my above ground pool in the winter? Winterizing an above ground pool is easy, and involves draining the water level down 12”-18” below the return jets, draining the plumbing and equipment and leaving a little antifreeze in the equipment to keep it protected. Alternatively disconnect the mechanical equipment, drain and leave in a heated garage! Contact us for a site inspection and quote.